Sociotechnical Identity influences threats to security? Video – CHDS Thesis Series Fall 2016. Seven Gerard. Academic studies abound focusing on the interface between man and machine, but the modern environment raises the question whether technology has graduated to a facet of individual identity. Gerard writes on the concept of “technoself,” and he delves into whether technology exists beyond its simple physical form as a component of human identity and how that may influence behavior, particularly in the context of Homeland Security. More episodes from the Viewpoints video podcast. 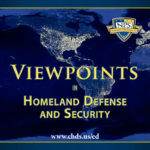 Master’s theses, from homeland security students at the Naval Postgraduate School, are available in the Homeland Security Digital Library.